2018 Volkswagen Polo reader test team review | What Car? A stunning rejuvenation of the small hatchback class is under way. First, there was a replacement for the Ford Fiesta, perennially the UK’s best-selling car. Next up was the Seat Ibiza, which went from also-ran to standard-setter. Now, there’s a new Volkswagen Polo, another big-selling car in this class. In the face of such competition, Volkswagen has gone all out to make the Mk6 Polo lighter, more spacious and classier inside than before, introducing more technology and personalisation options while keeping prices close to those of the current car. The new car’s looks go some way towards casting off the Polo’s conservative image, too. Based on our first driving impressions, we’ve given the new Polo – which is on sale now, priced from £13,855 – a five-star rating. 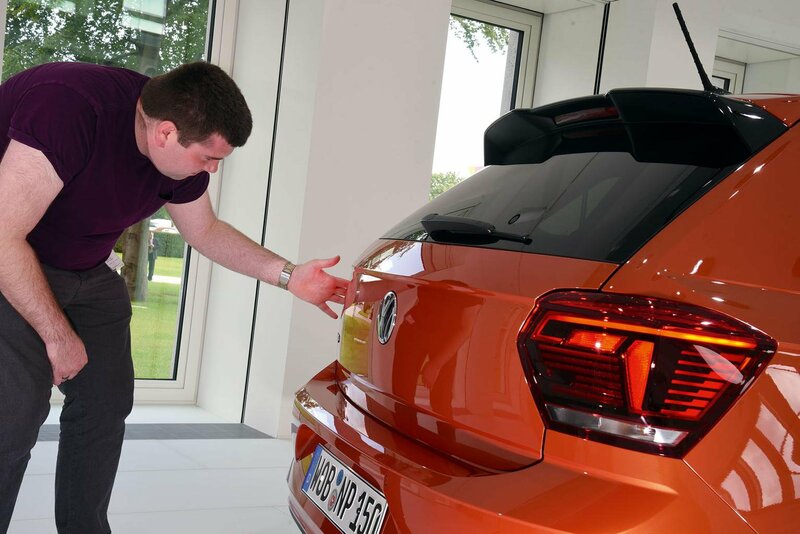 To find out if it’ll go down as well with buyers, we invited readers to see it at Volkswagen’s factory in Wolfsburg, Germany. “The outgoing Polo is very well engineered but pretty boring. “This new model looks more dynamic, although ‘sportiness’ will really have to be determined by how it drives. It feels more upmarket inside than before, too. “This car has very purposeful styling. The numerous sharp lines down the sides of the car make it look very defined, and I really like the intricately detailed headlights and tail-lights. “Some plastics are a bit scratchy, but for interior quality and design, it matches the Seat Ibiza. 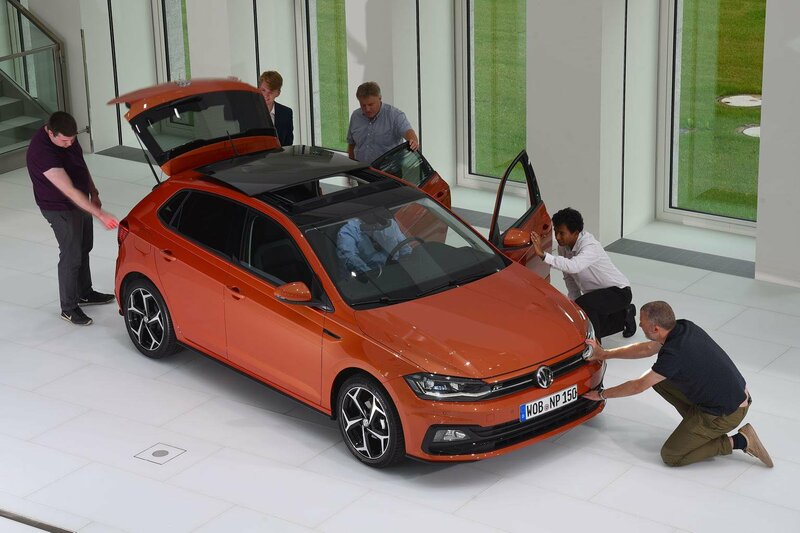 “The size increase over the old Polo is definitely noticeable, but I doubt many people will swap their Golfs for this car; it’s still too cramped for three in the back. Head room isn’t bad for me – both in the front and rear – at 6ft tall, especially considering that this test car has the optional sunroof, which usually cuts an inch or two. “The driving position is fairly standard for a small hatchback, and it gives you good visibility thanks to narrow window pillars. “My partner and I have a two-year-old and are due a second child, so we need a new car that’s roomy, practical, comfortable and easy to drive in the city and on long trips. “On the first three points, this new Polo definitely lives up to expectations. It looks sharper and more grown-up. I’d prefer to have the larger Golf, but realistically the Polo is now big enough to meet my needs. “Inside, space is quite generous and the boot is adequate; it has a capacity of 351 litres, which is up 25% on the old Polo, much more than the Ford Fiesta and almost identical to the Seat Ibiza. A buggy and some shopping will fit. “Which has the better PCP deal will probably decide whether I buy the Polo or Ibiza, although the Polo’s interior is better, in my opinion. “The infotainment touchscreen is glazed, so it’s very responsive. There’s the option of sat-nav, and you can use your smartphone through the optional Apple CarPlay and Android Auto smartphone mirroring apps. “The Polo’s rear doors open wide enough for me to easily fit child seats, and the Isofix anchoring points in the rear are so easy to use. “I’ve had the previous three Polos. They’re great workhorses, so I’m considering buying this new model for my 19-year-old son. “It has the potential to be a bit more exciting, rather than just filling its traditional role of the family’s second car, because while it’s nothing radical, it does look a bit sportier, and I hope the way it drives matches that. “It’s significantly bigger than the old Polo, so there’s lots more space, especially leg room, in the back. There’s good head room in all seats, too, and because the car is wider, it’s more comfortable. “I’m not sure I quite agree with the thinking behind the growth, though; this is supposed to be a small hatchback, after all. I can see, however, that it could now work as both an urban runabout and a car for young families. “Simplicity is the Polo’s hallmark, and thankfully that hasn’t been lost here; this model is roomy, high-quality, conservative and practical.